Is a Homeowners Association Required to Install and Maintain AEDs? The issue of whether or not a homeowners association is required to install and maintain an automated external defibrillator (“AED”) on-site is a question that has not been directly addressed by California courts. As a result, many community members and Board of Directors (“Board”) seek legal guidance and clarity as to the same. 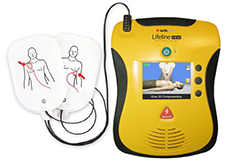 In particular, associations that maintain common area facilities and accommodations such as a gym, basketball court, tennis court, or swimming pool, feel the need to maintain an AED due to the rising number of lawsuits that are being filed against businesses and corporate entities for failing to maintain same. The main cause of action named in these lawsuits is one of negligence, wherein plaintiffs claim the landowner has breached its duty of care by failing to maintain an AED on-site; chief among these cases is Verdugo v. Target Corp. (2014) 59 Cal.4th 312. In this case, Verdugo, age 49, suffered a sudden cardiac arrest while shopping at Target and died despite the paramedics’ attempts to revive her. There was no AED in the store. Verdugo’s family members filed the suit against Target claiming that it breached its duty of care to its invitees (i.e., business guests) by failing to maintain an AED in the store. However, the Court ruled in favor of Target holding that it did not owe a statutory or common law duty to maintain an AED. The Court found that Target did not owe a statutory duty of care under California Health and Safety Code (“CHSC”) §1797.196 because it only imposes obligations on an entity or person that maintains an AED; the statute does not require them to maintain same. More importantly, the Court reasoned that while Target owed a reasonable duty of care to provide assistance to a patron in medical need, maintaining an AED exceeded the scope of duty. The Court looked at two factors: (1) the degree of foreseeability that the danger will arise on the business’s premises and (2) the relative burden that providing a particular precautionary measure will place upon the business. In its evaluation of the two factors, the Court found that there was no reason for Target to foresee that shopping within its premises would increase the risk or cause an invitee to go into cardiac arrest. Secondly, the burden of regularly maintaining an AED (in accordance with all federal and state regulations) and trained personnel on-site was not minor or minimal, outweighing the need for same. Although Verdugo dealt with a for-profit corporation, it appears to support the position that homeowners associations are not required to maintain an AED. Like Target, a homeowners association does not have any reason to foresee an increased risk of cardiac arrest within its premises from the mere fact an individual—whether it is a homeowner, guest, or tenant—is occupying a unit within the community or visiting. Every health studio, as defined in subdivision (h), shall acquire, maintain, and train personnel in the use of, an automatic external defibrillator pursuant to this section. Associations do not charge a “(gym) membership fee” for the use of its facilities within the association. Rather, the right to use an association’s gym facility is granted to association members via easement in the CC&Rs. In essence, the right is an included benefit that is afforded through the payment of monthly HOA assessment fees. Furthermore, the legislative intent to exclude homeowners associations is shown in the last sentence of subdivision (h), which states that a “‘Health studio’ does not include a hotel or similar business that offers fitness facilities to its registered guests for a fee or as part of the hotel charges.” Hotel patrons pay primarily to spend the night in the hotel dormitory, but incidentally benefit with the right to access the hotel’s facilities, such as the gym. Likewise, association members pay HOA fees for the primary benefit to reside in the community, but are also afforded the incidental right to access the association’s facilities (i.e., gym, clubhouse). Lastly, such legislative intent is further supported by CHSC §19300, which expressly excludes structures built on or after January 1, 2017 containing “single-family and multifamily dwelling units” from the requirement of maintaining an AED. However, homeowners associations should be aware of pending legislation AB 1766, which if passed, would require associations that charge a separate fee for the use of its swimming pool to install and maintain an AED. In light of the above, the general consensus under California law seems to be that homeowners associations are not required to maintain an AED, until courts express otherwise. However, should an association desire to maintain one for the benefit of its members, it should be weary of all the laws and regulations that it must comply with in doing so—particularly CHSC §§104133, 1797.196. It is of crucial importance for homeowners associations that are considering the installation of an AED to balance the pros and cons of its maintenance; in particular, the liability issues that may arise from the misuse or failure to properly maintain the device in strict compliance with the law.